This week we needed a place to eat in Leytonstone on Friday night as we had tickets to watch a friend ‘s performance in Pygmalion with the Woodhouse Players. A quick google search led us to Singburi (Royal) Thai Cafe. The name is grander than the restaurant looks – strip lights, veneer wipe-clean tables, kitch trinkets, potted plants, paper napkins and well-thumbed laminated menus. But I can forgive dated decor as long as the food sings and the reviews promised this was the real deal. The bright yellow, glowing frontage makes this place look like any other take-away along this stretch of Leytonstone High Road, certainly not the kind of place you’d need to book. But a reservation was advised, and when we phoned for an early table we were surprised to be told they needed it back by 9pm – that worked fine for us. So we weren’t sure what to expect when we finally found the place at the far end of Leytonstone High Road from the tube, just past the overground station. It’s near the Tesco express – which is handy as it is unlicensed and BYOB with no corkage charge. The menu contains all the standard starters – fishcakes, chicken satay, soups, papaya salad, spring rolls and prawn crackers. Then about 10 curries, a range of stir-fries, Phad Thai noodles and veggie options. But we overheard a neighbouring table ordering clams. A thorough search of the menu didn’t reveal any clams, where are the clams? 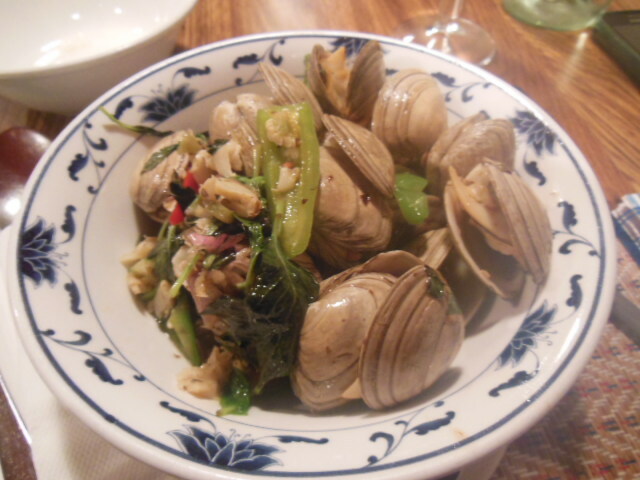 I now really want clams! Then we spotted the specials scribbled on a white board at the back of the restaurant. Now we’re talking – soft shell crab, seabass, morning glory, green tea ice cream, durian fruit, mysterious Moo Krab and the clams. Decison made, we ordered the clams of course (£6.50) as well as the Thai fishcakes, and then green chicken curry extra chilli (£7.50), and another special, the squid and chives (£8). The clams arrived just after my quick dash to Tesco’s for a bottle of wine. These were described by the staff as medium spicy, now we love chilli but this dish has strips of tongue searingly hot red and green chillis, plus loads of garlic and fresh Thai herbs. The flavours were amazing in this steaming seafood bowl. Thai green chicken curry – extra hot! 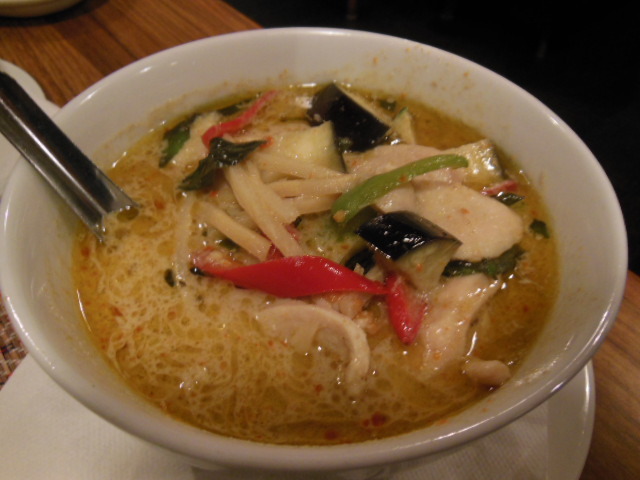 The green curry was certainly extra hot and contained plenty of chicken, aubergines and peppers. 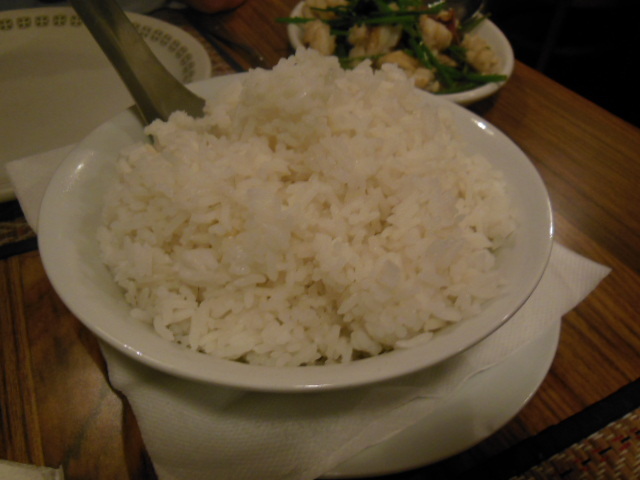 The rice was a generous serving unlike the usual Thai restaurants – we could have shared it between us and next time we’ll order an extra vegetable dish instead. 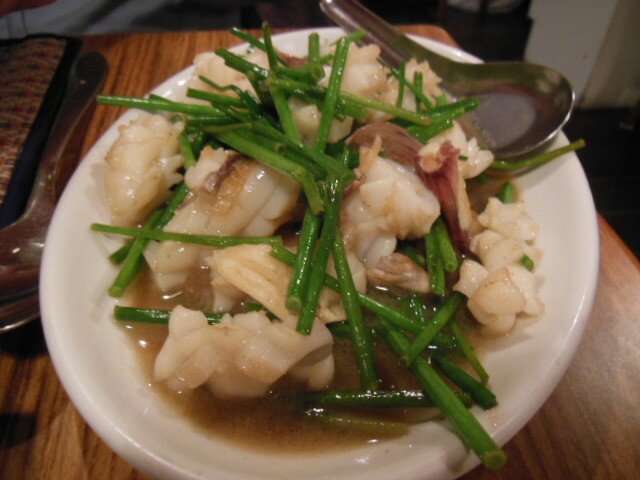 The squid and chive dish was delicious, heavily-infused with the flavour of roast garlic. It’s popular with locals dropping in and also ordering take away – 3 orders were collected in the hour we were there, and now I know why – we’ll be making another reservation very soon. Tues-Sat 6-11pm, Sun 6-10pm, closed on Mondays. This entry was posted in Restaurants beyond E17 and tagged Authentic thai, BYOB, Clam, Leytonstone, Sing Buri, Squid, Thai cuisine. Bookmark the permalink.